We’ve all heard the saying “A picture is worth a thousand words.” But a picture of your marketing data can be worth much more than words! If you’re using charts or graphs to present your work to your stakeholders or clients, pictures of your data could be worth LOTS OF MONEY. Data visualization can also be critical to your internal reporting. Using a dashboard can help your team track their progress and achieve their goals faster. But creating a picturesque, “budget approved” worthy marketing reports can take forever. As I much as I hate to admit it, I used to spend 30+ hours a week building reports for clients. Fortunately, nowadays, there are tools like Google Data Studio (GDS) that can help make reporting easier. Using GDS, we can significantly reduce the time it takes to build reports. And with the right game plan, we can also use Data Studio to create reports that capture our grand marketing vision. Reporting is critical to every business. Reports show clients, team members, and stakeholders the results of our marketing efforts. Reporting also plays a vital role in getting budgets approved and contracts renewed. But there are two major obstacles to delivering the kind of reports that get people to take action. The first obstacle is time. Gathering data and formatting charts can eat up hours and hours of time. The second obstacle to effective reporting is your strategy. Without a strategy, reports have a habit of turning into a jumbled mess of disjointed KPIs. It’s our job as marketers to make sure our audience can follow our reports. So we need to create reports that communicate a story about how our marketing efforts impact our objectives. An effective marketing report should highlight our results and provide conclusions that decision-makers can use to take action. In this tutorial, we are going to learn how to use Google Data Studio to reduce our reporting time and effort. When is a reporting dashboard more than just another pretty picture? Before we get into the meat and potatoes of this tutorial, here’s sneak-peek from the live Data Studio Course I presented in Minneapolis last month. This video will help you understand the value Data Studio can offer. And it will show what we can accomplish when we combine strategic reporting with some Data Studio skills. There are three key ingredients that make Google Data Studio such a useful platform. The visualizations in Data Studio are easy to use. They also feature a lot of design options. And they approximately 67.43x more attention-grabbing than the Excel charts and tables, or the default Google Analytics dashboards. Connecting Data Studio to your other marketing systems can save you from hours of data gathering. 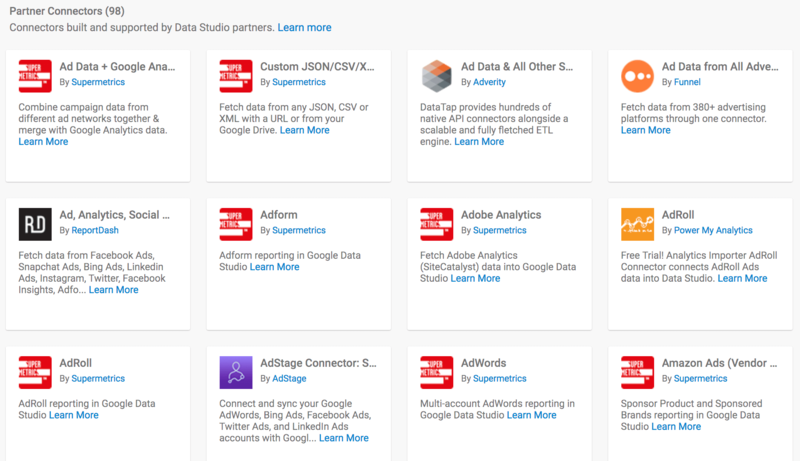 Data Studio natively connects to over 17 different platforms. These platforms include Google Analytics, Google Ads, YouTube, and Google Sheets. You can also use the Data Studio partner connectors to hook up to over 90 other data sources. Facebook, LinkedIn, Twitter, Pinterest, SEMRush and many other platforms. Data Studio reports are live. As long as your marketing systems are connected to Data Studio, your dashboard can serve as a real-time picture of your KPIs. Setting up your Data Studio account is a simple process. 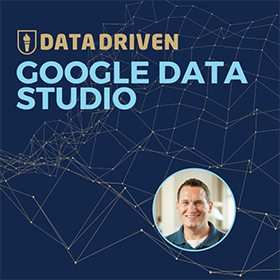 The only thing you need to get started with Data Studio is a Google Account. 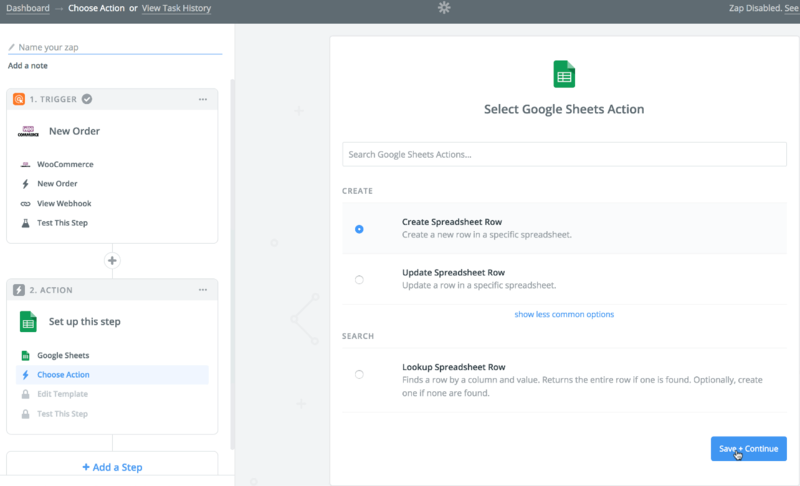 For storage, Data Studio automatically integrates with Google Drive. So, you’ll be able to access any reports you create from your Drive, as well as the GDS interface. 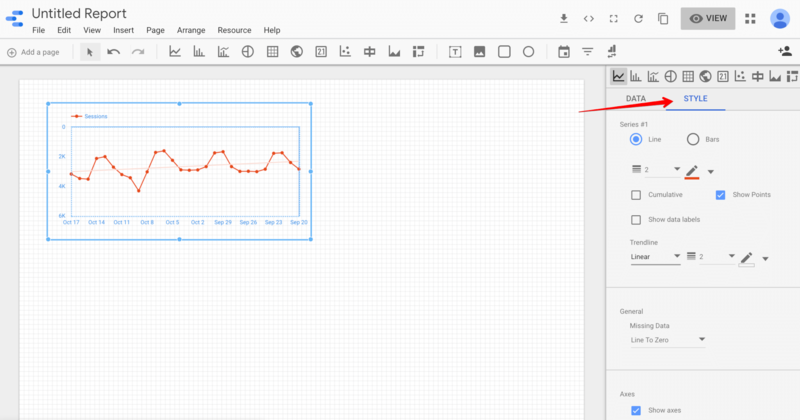 Before you can begin working with the charts and graphs in Data Studio, you need to connect to a data source. Data sources are like a reporting “easy-button” inside of GDS. Once you’ve added a data source to your account, it’s available for you to use anytime you need. Data sources provide a live connection to your marketing systems. And these pre-built connectors save you from exporting data every time you want to build a new dashboard. 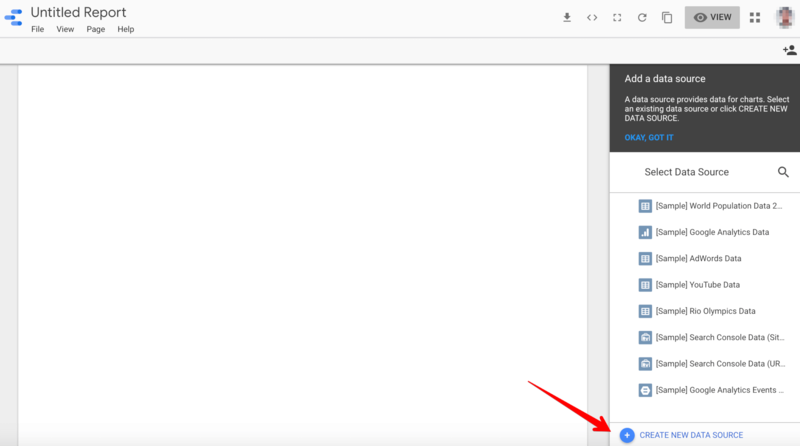 When you create your first report in Data Studio, Google offers you the opportunity to connect to their sample data sources. The sample Google Analytics data comes from the Google Merchandise Store. Working with Google’s sample data is a great way to get acclimated to Data Studio. In the video below, we’ll walk through how to start building charts and graphs using the Merchandise Store Data. 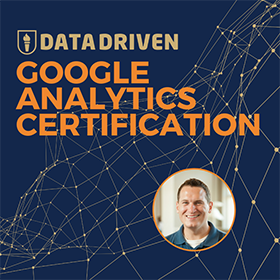 But, I’ve also detailed the steps you need to follow to connect GDS to your own Google Analytics (GA) account in this post. You can add new data sources to your account from right inside your reports. 1. Click the blue “+” icon to create a new data connection. 2. 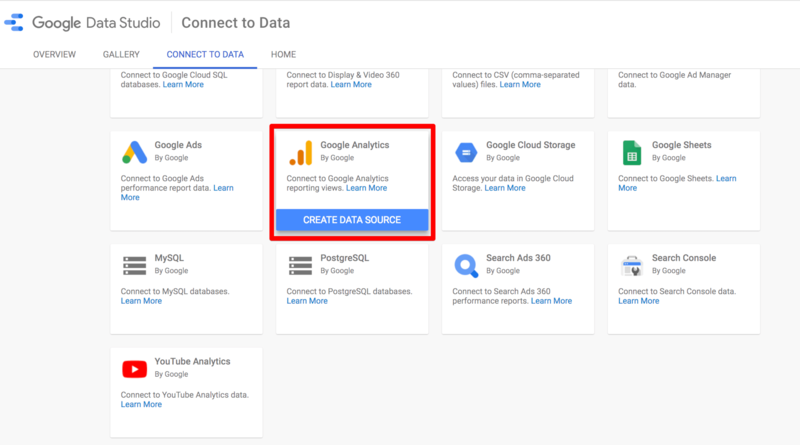 Then, select the Google Analytics data connector. 3. Next, you will need to authorize Data Studio to access your Google Analytics account. 4. Then, choose the account property and view you want to connect to GDS. 5. Add the fields from your account to your report. GDS accesses your data via the Google Analytics API. So before Data Studio does an import, it will display a list of all the metrics and dimensions you have available. You have the option to disable any of these fields before you create your report. But you can also access and edit these fields from your reporting screen. Now that you’ve connected to a data source, you can start drawing the visualizations. 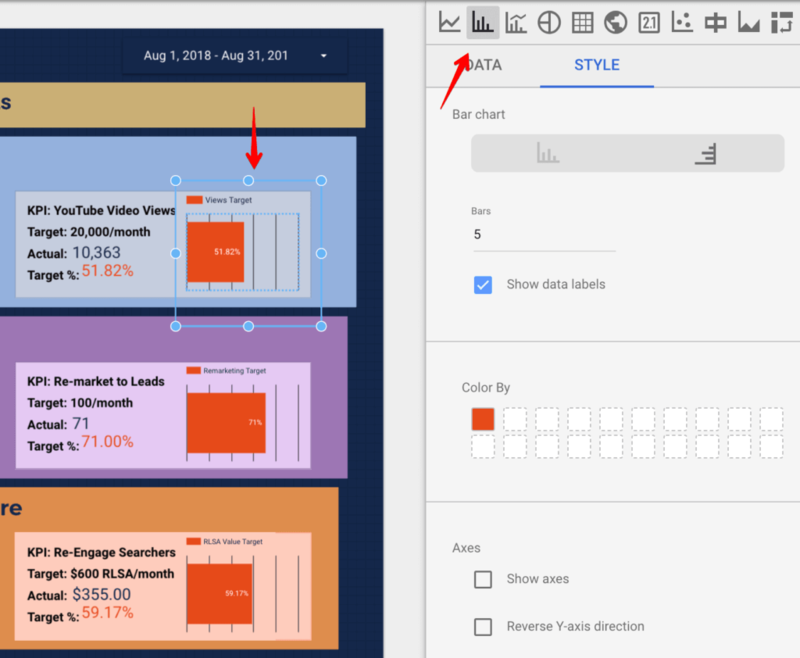 Adding visualizations to your report in Google Data Studio is pretty straightforward. Time series graph, bar chart, pie chart, table, geo map, scorecard, scatter chart, area chart, bullet chart, area map, or pivot table. To add a visualization, simply select the one you want to use, and draw it into your report. Your visualizations (except for scorecards, and bullet charts) need two data points to work – a metric and a dimension. 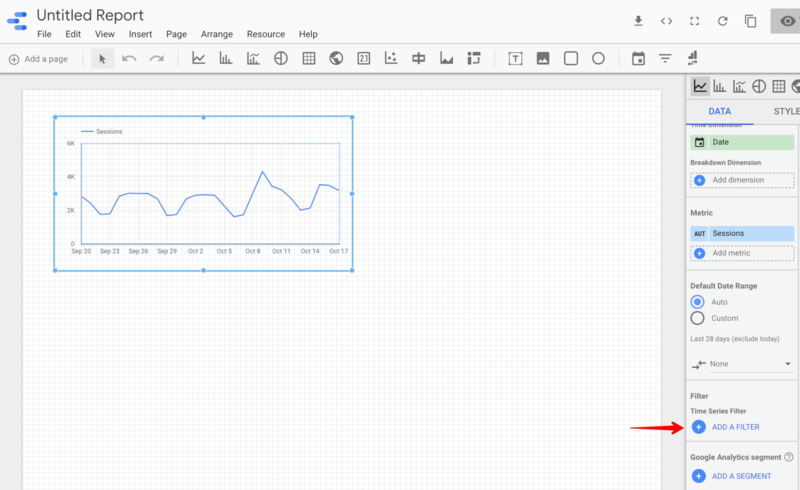 After you draw a visualization, you’ll see your data/style menu pop-up on the right-hand side of your screen. This menu is where you’ll spend most of your time working in Google Data Studio. Data Studio has a “view only” relationship with your data sources… meaning, the adjustments you make in your in reports won’t have any effect on your data collection systems. So you can click around and play with the data in your reports as much as you want without hurting anything. However, just because you can’t damage your data in GDS, doesn’t mean you’ll want to give others edit access to your reports. 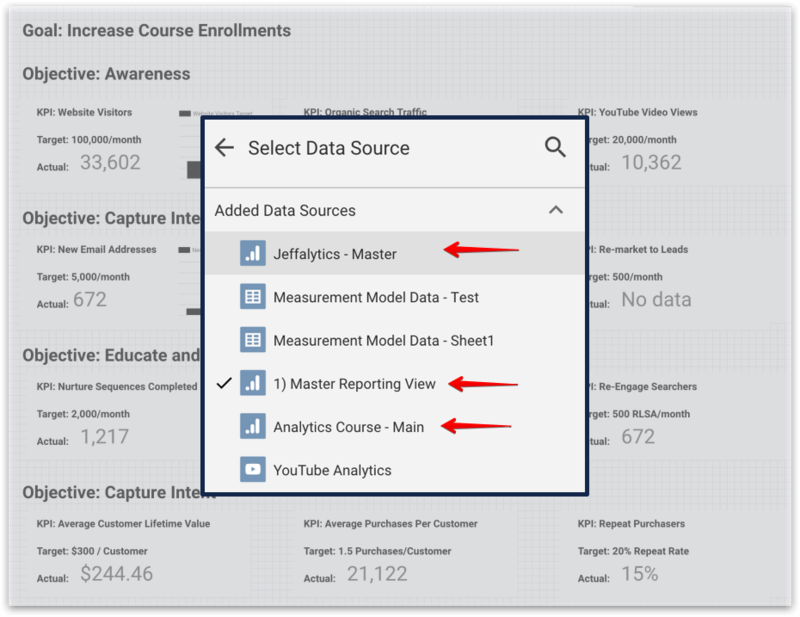 Within Data Studio itself there are two levels of access, edit, and view. Anyone with edit access has free reign when it comes to working in your reports. They can manipulate your charts and tables. They can also adjust your data sources, and see all your data. So it’s wise to limit edit access to your trusted team members. View access in GDS only allows others to see the front-end of your report. This is the access level you’ll typically provide to clients or people outside your team. If you want to allow your clients or team members to manipulate the data in your reports, consider using date pickers and filters. These tools provide some basic filtering options, without allowing others to access the back-end or your report. 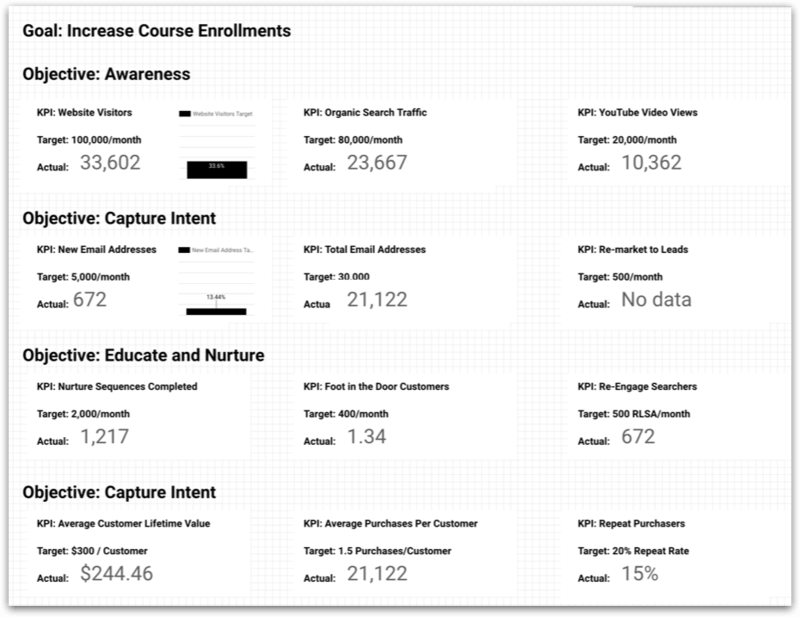 Google Data Studio even allows you to share interactive reports publicly on your website. Just grab the embed code for your report. And paste the code into your CMS editor or your page’s HTML. Sometimes, starting with a blank report can feel overwhelming. One of the best ways to avoid blank-canvas-syndrome is to use other dashboards for inspiration. 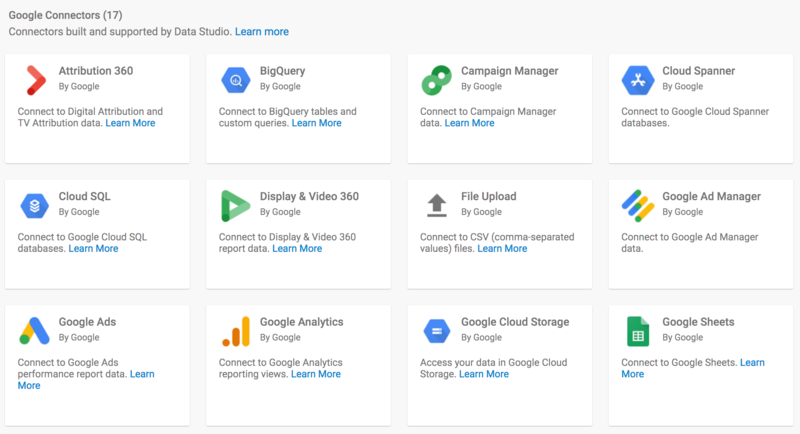 Data Studio is one of Google’s newer products and was just moved out of beta last month. So the template gallery is a little sparse at this time. That said, you can still find plenty of cool visualizations to emulate… Like the channels report in the Google Analytics Marketing template. You can apply this visualization to your report with a little bit of reverse engineering. To use this report in your account, click on the “use template” button. Then select a data source you want to use with the template. After you imported the template into your account, you can view it in edit mode. Then you can dissect this visualization and reconstruct it in your other reports. Using pre-built templates and borrowing from other reports is a great way to get started. It can be fun to play with around with all the preformatted charts and graphs in the Google Data Studio templates gallery. But as pretty as these pictures are, they don’t often translate directly to your business. For example, the Google Analytics marketing template looks great! But is the information in this report really all that useful? Probably not, because it’s just an overview of some broad metrics. Instead of putting together a report only that provides a 100-foot view of your business, let’s work on building a dashboard that captures the specifics of your marketing funnel. 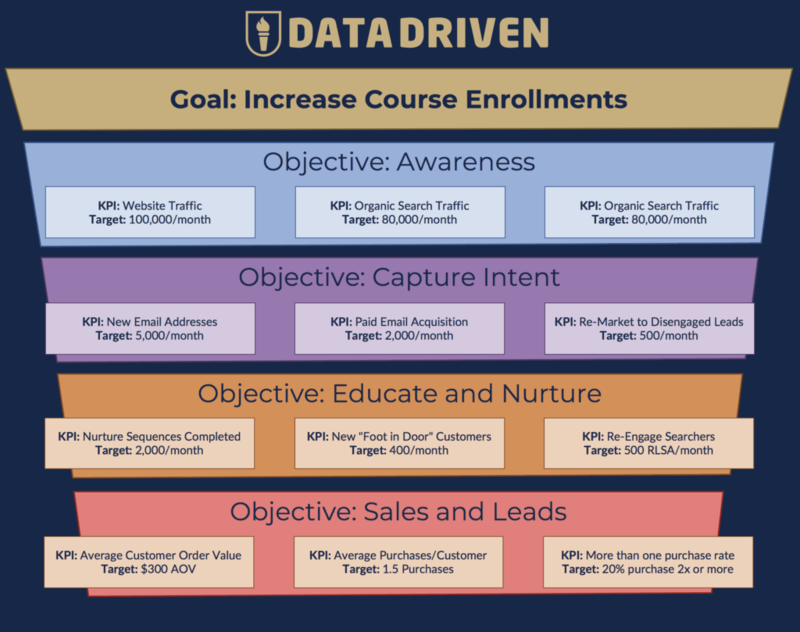 Before we start building our custom dashboard, we need to define our marketing objectives. Why do we need to identify our objectives first? Because if you don’t know what you’re supposed to report on, it’s going to be impossible to build your dashboard. Yes, I understand that defining your objectives can be a pretty daunting task and it can feel intimidating to try put your goals into context. I also understand that it will be challenging to create a picture of how your marketing activities are helping you accomplish your objectives. But I have good news! To help make this task a little less challenging, I developed a framework to guide us through this process. 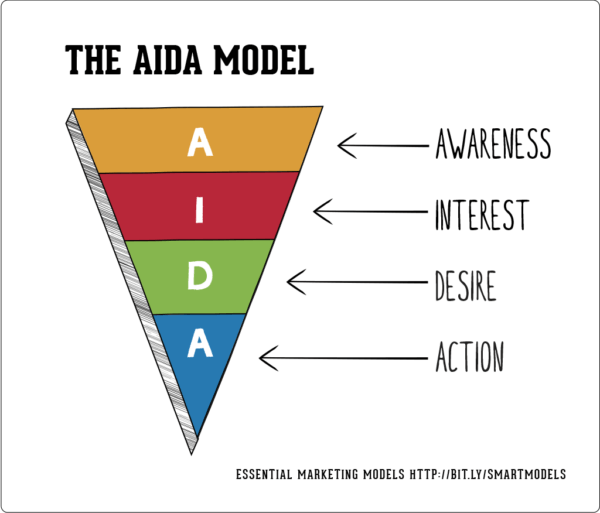 The ACES framework is my take on the classic marketing funnel model – AIDA. AIDA is an excellent tool for envisioning a marketing funnel and getting familiar with the funnel stages. But AIDA doesn’t always put your marketing into context, and it definitely doesn’t set targets for your business. Without context or targets, it can be difficult to understand how your efforts affect your objectives. ACES is intended to help you apply a data-driven approach to your marketing strategy. The ACES framework can be used to help match your tactics to your objectives – and your objectives to your KPIs. Let’s walk through each stage of the ACES model to see how this works. And let’s look at how we can use ACES to match our marketing activities to our objectives. (A)wareness, (C)apturing Intent, (E)ducating (and Nurturing) customers, and making (S)ales. At the awareness stage of our marketing funnel, we attempt to introduce new customers to our brand. So any marketing that’s focused on reaching new customers is an awareness related activity. When we are trying to reach new customers online, we often do things like content marketing, social media posts, and display advertising. To report on awareness related marketing, we want to match each marketing activity to a KPI for our business. So, for example, if we are doing content marketing to attract new customers, we might include website traffic as a KPI in our report. If we’re using social media to create awareness, we might use post reach or social media traffic as our KPI. And if we use display ads to raise awareness, our KPI would likely be ad impressions. Capturing intent is the next step down the marketing funnel. At the “capture” level, we attempt to encourage our new audience to continue to engage with our message. We want to capture our audiences intent to learn more about our brand or products. And we want to establish a direct line of communication with our audience. Our “capture” efforts are often as simple as using a pop-on a blog post to collect email addresses, or adding a CTA to your social media message. Even your website contact form can be a source of capturing intent. We can also use advanced tactics, like sending traffic from paid ads to a landing page with a targeted message. After we’ve found a way to communicate with our potential customers, we want to keep our dialogue going. We want to nurture the interest that attracted our audience to our brand. And, we want to educate them about how our products relate to their curiosity. 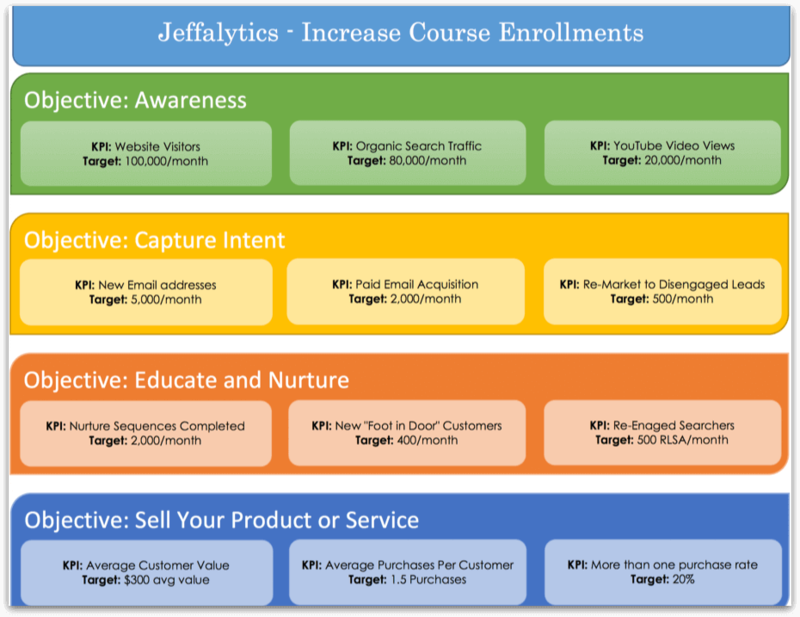 At this stage of our marketing funnel, we might give away free product samples, or invite email subscribers to webinars. These efforts are all intended to help customers get more familiar and comfortable with our products. The final stage of the marketing funnel is sales. This stage is where we try to convert our audience into paying customers. Most sales related activities involve motivating customers to make a purchase. But, not all marketing funnels are the same. And not all marketing teams are involved in sales. So sometimes your sales objectives won’t actually be related to selling. For example, your end goal could be to fully qualify a lead that’s then passed off to your sales department. 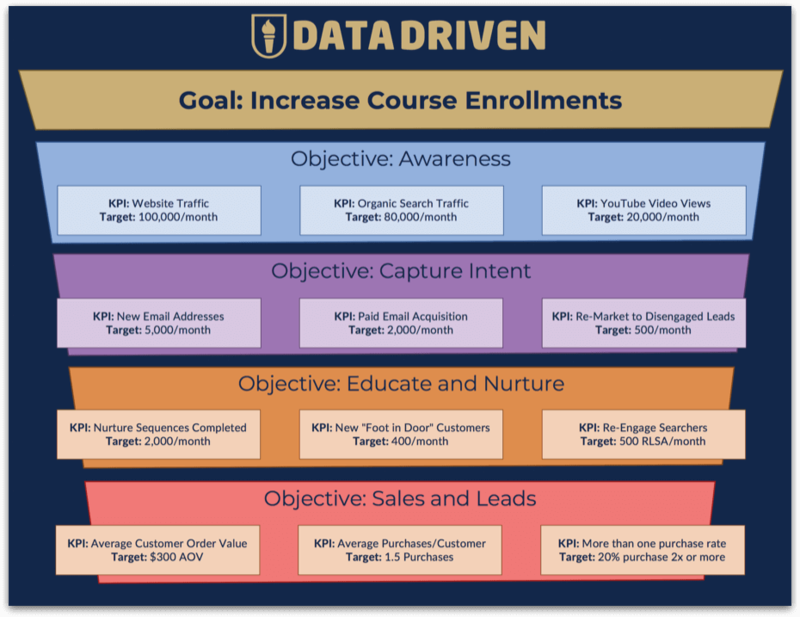 Now that we know what we can do with Data Studio, and we have a reporting strategy (ACES) in place, let’s walk through the steps you can use to create a dashboard that reports on your complete marketing plan. Because it can take quite a bit of wasted time to get formatting just right and hook up data sources in Data Studio, I recommend taking technology out of the equation when you’re getting started. Instead of messing with pixel-perfect design, draw your dashboard plans on a whiteboard, or with pencil and paper. I often start my dashboard designs by creating a manual drawing of my desired marketing funnel. The picture below is a poorly drawn representation of my ACES report. It’s a barely legible, crude version of what I wanted to create in my 2019 dashboard. But putting my objectives and KPIs down on paper saved me from wasting hours messing around in Data Studio. After you whiteboard out your dashboard/marketing funnel and KPIs, it’s time to create a lo-fi version of your report. My 1.0 version of my dashboard was done in excel. Why not just jump into Data Studio for this step? Well, you could. All these design elements like text boxes, shapes and color palettes are readily available in GDS. But Data Studio’s real magic is it’s data connectors, not its design functionality. So, If you’re just getting familiar with GDS, you’ll probably find it easier to wireframe your report in a presentation, spreadsheet, or graphic design tool. Some reports may require branding or a company color scheme. Upgrading the aesthetics of your lo-fi prototype will help you complete your dashboard roadmap before you get started in GDS. With a clear map of your report in place, you’re ready to get to work in GDS. The first thing you want to do in GDS is to connect to your data sources and get your metrics into your dashboard. Now that your report is functional, you can start to work on your design. 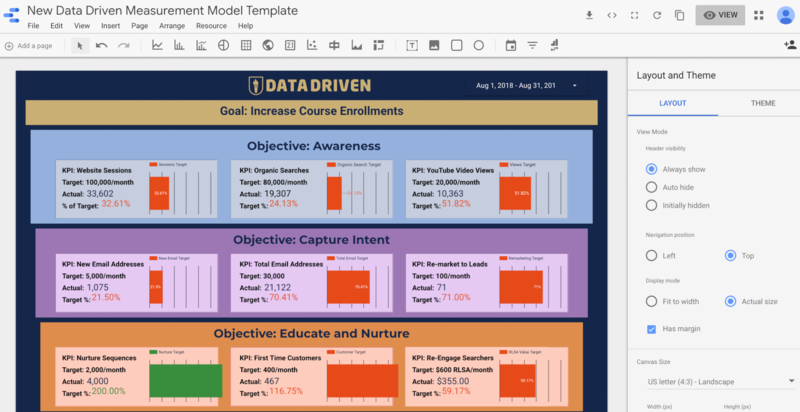 Once again, use the report prototype you created to guide your design, and you should have a pretty picture of your complete marketing funnel in no time! Which GDS visualizations and tools did we use to build our ACES dashboard? 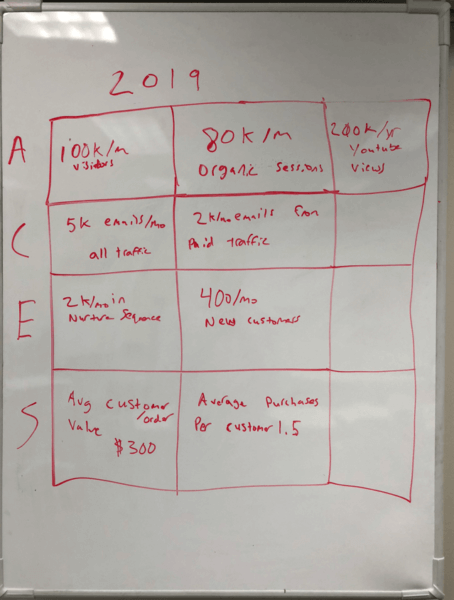 So we covered the process we use to create our ACES dashboard. But what about all the components and tools we used to build our report? Let’s dissect that part of our dashboard now. To display our KPIs, we used scorecards. Scorecards are a great way to focus your report on important numbers or objectives. 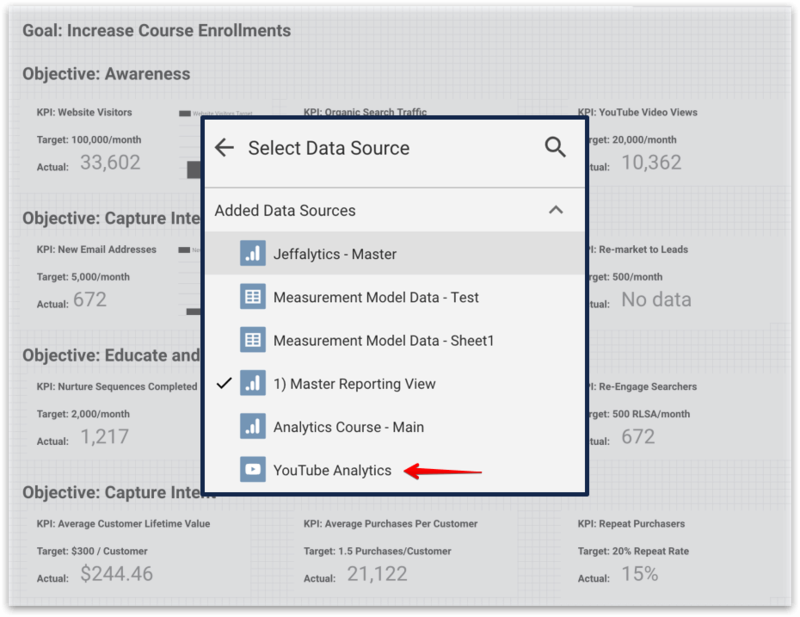 Calculated fields allow you to create new metrics for your report right inside of Google Data Studio. You can use equations or functions to manipulate the data in your reports. We used calculated fields (our KPI/goal) to create our targets. To help visualize our objectives in terms of our targets, we used bar charts. The majority of the data we need for our report was pulled from Google Analytics. The ACES dashboard uses data from multiple Google Analytics accounts. 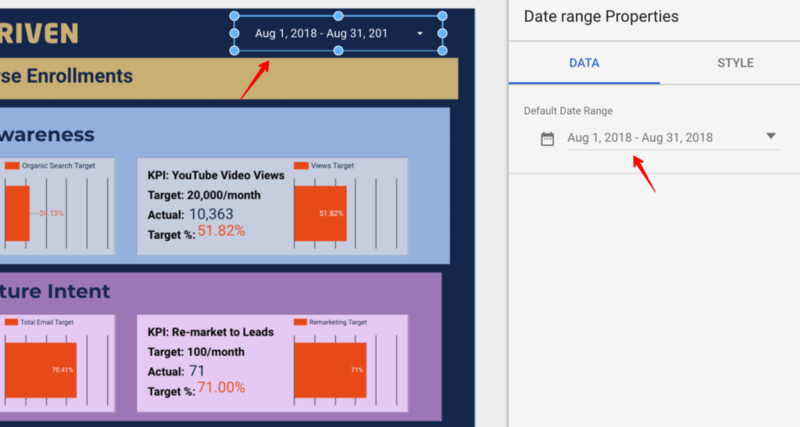 Our dashboard also uses the Google Data Studio YouTube connector to pull in data about our videos views. Sometimes there is no native or partner connector inside GDS to automate the data feed to your report. We ran into this problem when we tried to add our sales data to our dashboard. There’s no existing data connector for Woocommerce. (Supermetrics team, if you’re reading this, a little help here would be great!) So we used a workaround to keep our dashboard fully automated. We are using Zapier to send data from WooCommerce to Google Sheets. Every time a sale is triggered in our WooCommmerce account, our Zap updates our sales spreadsheet in Google Sheets. 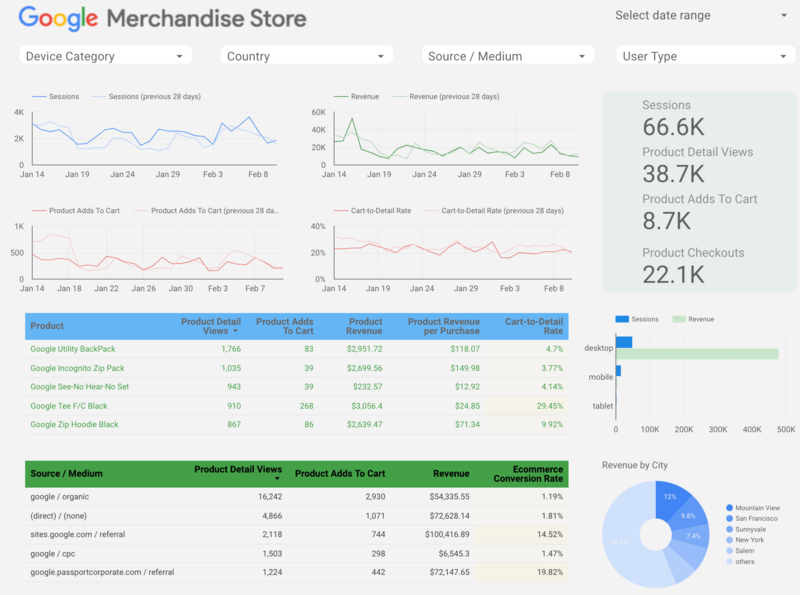 Then, we used the native Google Sheets connector in GDS to send our sales data to our dashboard. I wanted my team to be able to see both a current and historical view of our dashboard. So, I’ve included a date range selector that allows users to choose the time period they view in our dashboard. Our ACES dashboard incorporates just about every design feature available in Data Studio. We are using text boxes, custom colors, logos, shapes, etc. We are using view mode to share our report within our team, and every team member has access to this dashboard via Google Drive. 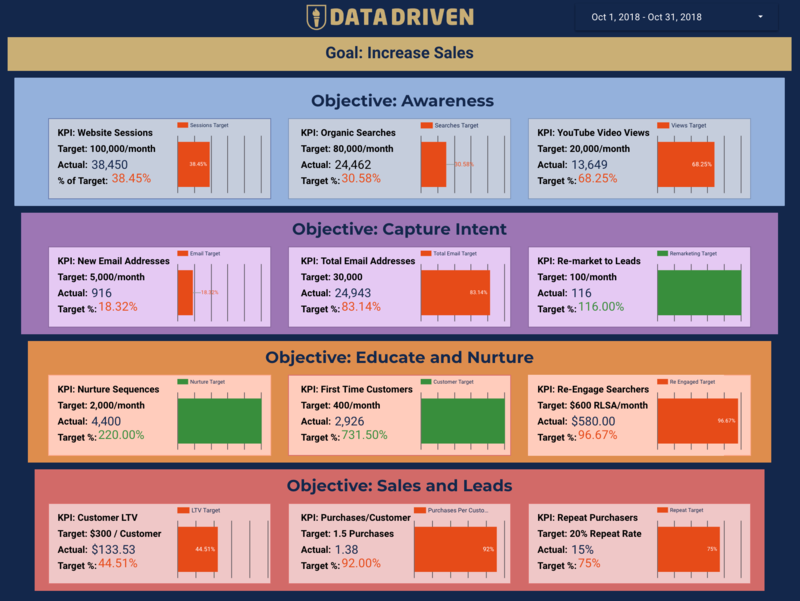 The most important aspect of our dashboard is that it matches our strategy. We can use the dashboard to see how our efforts impact our KPIs. And each of my team members can see a clear picture of our marketing funnel. Also, our dashboard saves us from jumping from one platform to another see how we are doing. We can simply check our ACES dashboard anytime we need to get an update on our performance. Now, I know we covered a lot of ground in this tutorial. We started by looking at how Google Data Studio can help us make reporting easier. We also walked through an overview of all the tools available to us in Google Data Studio. And we looked at how we can use GDS templates with our data sources. Then we changed direction a bit and delved deep into some marketing strategy. 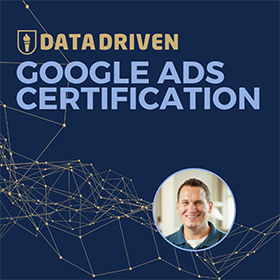 Finally, we wrapped everything up by looking at how we can use Google Data Studio to capture our marketing strategy, KPIs, and objective in a single, live automated report. The journey we took together in this guide was pretty extensive. So I suspect you might have some questions. If you have questions, clarifications, or observations about the material we covered, leave a comment below. I’d love to hear what you think about the ACES dashboard and reporting strategy. And I’m also happy to answer any questions you have about building reports in Google Data Studio. Want to add our ACES Dashboard Template to your GDS Library? As we discussed earlier in this guide, the great thing about GDS templates is that all you have to do to use them is plug in your data sources and adjust the metrics. When you use a dashboard template, 90% of the work is done for you.